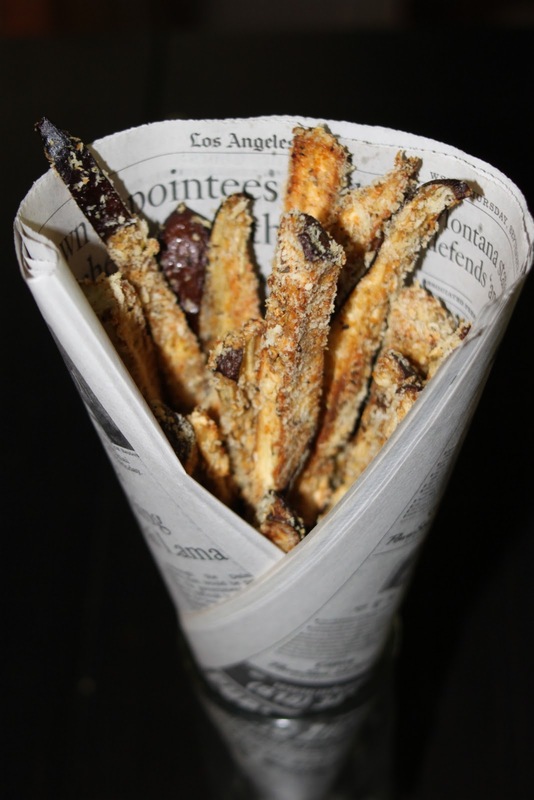 Eggplant fries? Sure! Why not? Why should the potato, the sweet potato, the zucchini, the green bean, and even the asparagus have all the fun of being cut up and fried? 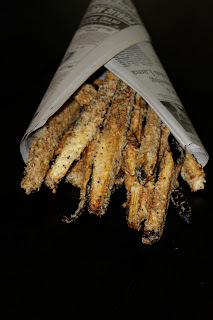 I saw a recipe for eggplant fries, which struck me as fabulous... and not just because I happened to have 2 large and 4 small eggplants in my fridge. Honestly, who needs 6 eggplants? Anyway, I am never going to be the person who says "You know what sounds good right now? Eggplant!" However, I am really not opposed to it either. My husband, on the other hand, is an eggplant fiend. I think he ordered eggplant on our first three dates together. No lie. But these fries turned out to be so delicious, that I ended up eating them all myself. That is right. I took a large eggplant, cut it up and baked it, and proceeded to eat every bite of it myself. In a million years I never could have seen that coming. I didn't really follow the recipe I found. I decided to go with my past experience of making various veggie fries, and try a couple of those tricks.... I dredged them in milk and then bread crumbs, like I did the asparagus. And I baked them rather than frying, like I did the green beans and zucchini. I think the result is a very delicious, very easy, mostly good-for-you snack. Or side dish. Or entire meal for one, as the case may be. Preheat the oven to 450. Lay a piece of parchment paper on a baking sheet, and spray lightly with non-stick spray. (I don't think it would be necessary to keep them from sticking, but it helps them get nice and golden brown). Cut the eggplant into sticks about 1/2 inch wide, and as long as the eggplant. Stir together the bread crumbs, parmesan cheese, parsley, and garlic powder. Dip each piece of eggplant in the milk and then in the bread crumb mixture. Bake for 10 minutes, then flip them all over. Bake another 10 minutes, until they are nice and golden brown, and crispy on the outside. I dipped mine in ranch dressing ('Cause it was easy), but I can only imagine how great they would be in aioli or ketchup or marinara sauce. Enjoy!